Spike Lee's “BlackkKlansman” has an obvious message and it never claims to be fair or impartial in terms of relaying it: racism, particularly racism against blacks, continues to exist in America and white supremacists, as well as people like Donald Trump, are propagators of it, not to mention evil, illogical and intelligently inferior. Let me start by admitting I'm of the same persuasion as this film and there's no doubt this played a role in my liking and responding to it as much as I did. However, politics aside, at its base, “BlackkKlansman” simply tells a riveting, often unbelievable story, one that's a rich blend of humor, suspense and human emotion. And because Lee infuses each of these qualities with his typical energy and enthusiasm, the result is a film with the kind of momentum and watchability that makes it entertaining for viewers of all backgrounds and points of view. Whether or not you agree with its values is one thing, but most could probably acknowledge “BlackkKlansman” is at least well made, and at the end of the day, for a Hollywood movie, that's what counts. 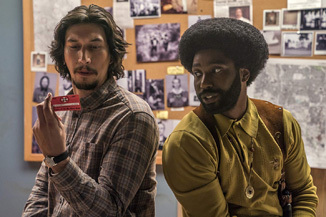 Adapted from Ron Stallworth's 2014 memoir titled, “Black Klansman,” Lee's adaptation begins by telling us his latest “joint” is “based upon some fo' real, fo' real sh*t.” It then sets its unabashedly overt tone and declares its barefaced message, namely that racism against blacks is still heavily peddled through several social and cultural avenues. And Lee, being the avid film lover that he is, focuses primarily on its rampant presence and history in the cinema, from as early on as D.W. Griffith's acclaimed and standard-setting “Birth of a Nation” (1915); to Victor Fleming's highly revered “Gone with the Wind” (1939); to supposed black and white film strips instructing viewers that whites are the superior race; and yes, even the “Blaxploitation” films of the 1970s, which, like the others mentioned in this list, also perpetuated black stereotypes, albeit “positive” ones. So while “BlackkKlansman” may have the outward appearance of a crime and historical drama, it's also a self-aware commentary on the role film plays in forming people's views. And Lee makes it clear he'll use his film, just as the makers of the aforementioned ones used theirs, as a tool to make a statement about blacks, although Lee's hope is that his will be positive and ultimately push for long overdue change with regard to how America shamefully tolerates racial inequality. Luckily Lee and his team have wrapped their subject in a throughly engaging narrative, one that's familiar and manipulative (as all films are) but builds gradually and patiently toward a powerful and emotionally shattering conclusion. It essentially follows Stallworth (John David Washington), the first black detective in the history of the Colorado Springs Police Department, as he goes undercover to infiltrate the Ku Klux Klan. Stallworth keeps Patrice in the dark about his real job as his operation with Zimmerman gains more traction. He even goes so far as to befriend and set up a meeting with staunch KKK leader and “Grand Wizard” David Duke (an eerily convincing Topher Grace). It's not easy, though, and there are several close calls where Stallworth and Zimmerman's cover is almost blown, especially by the more fanatic Klan members who are always suspicious about Zimmerman's loyalty and real identity (“You sound different on the phone.”). But their investigation eventually culminates with Zimmerman's induction ceremony into the KKK and a tragic climax that mostly feels like the work of a screenwriter (as opposed to how actual events played out) but is nonetheless effective. Despite being a genre picture, Lee and his writers devote an impressive amount of screen time to the characters discussing thoughtful topics like racial identity, race loyalty, and the role cinema plays in shaping values. These, in turn, raise questions for the audience, like what is expected of you if you're white, black or Jewish? Should you automatically think and behave a certain way? If you don't always put your race first, especially if you're a member of a persecuted race, are you a traitor? Should we feel guilty for performing our day jobs, which sustain and feed us, if they perpetuate a system that does other people harm? What are the ramifications of patronizing an art form that can often be detrimental to and misleading about the types of people it portrays? Are “good” stereotypes necessary to deflate the bad ones? Such questions have been asked before, but they're refreshed here, and one of the most powerful aspects of “BlackkKlansman” is it doesn't leave the audience out of the conversation or let us off the hook. It really pushes us to deliberate on what it's saying. And in light of this country's recent tragic events with regard to race, particularly between blacks and white supremacists, it should absolutely be pushy because its questions are more relevant than ever. In fact, Lee tops the film off with a disheartening and, in my case, tear-inducing, sequence that illustrates the recent resurgence of violence and devastation that can arise when racism is practiced and tolerated. “BlackkKlansman” is thoughtful, entertaining and thrilling, a stirring film that occupies our minds and heart long after leaving the theater. It reiterates a message we've heard before but obviously not enough, because if we did, it wouldn't be so easy to draw parallels between the film's events, which took place 40 years ago, and those happening today.